We are continuing with our internal housekeeping and today its turn of the WebRank Extension for Opera Browser. The UI is much simpler to use and focuses more on content. In the new version you get a widescreen friendly layout, ability to check your website security(WOT, McAfee Site Advisor and Norton SafeWeb), the location of your server, and new additions to the Sociometer with Facebook Likes, Tweets and Google Plus. Some of the features carried from the previous version though improved are various website ranks like Google Pagerank, Alexa, Quantcast and Compete rank, alongwith backlinks accorsing to Google, Bing and Alexa. That’s not all, you can also check the number of pages indexed by Google and Bing alongwith traffic graphs. A simple to use SEO analysis extension that works without ever leaving your current webpage. 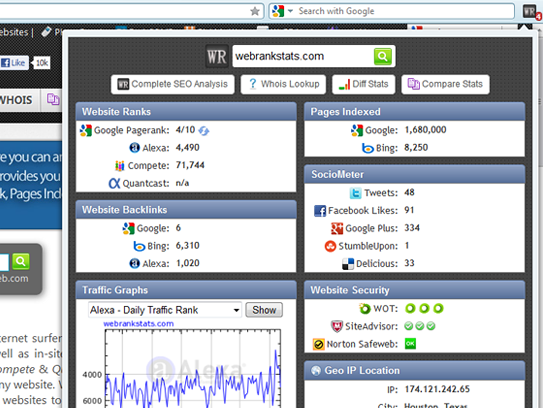 This entry was posted in Extensions and tagged opera extension, seo, seo extension, seo opera, traffic graphs, webrank opera, webrank seo, website security by WebRankStats. Bookmark the permalink.